To continue to educate the public on Westfield in Bloom initiatives, the Downtown Westfield Corporation (DWC) has provided the Westfield Memorial Library with an informational poster. 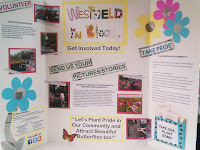 The poster encourages people to take pride in their town and get involved in Westfield in Bloom. 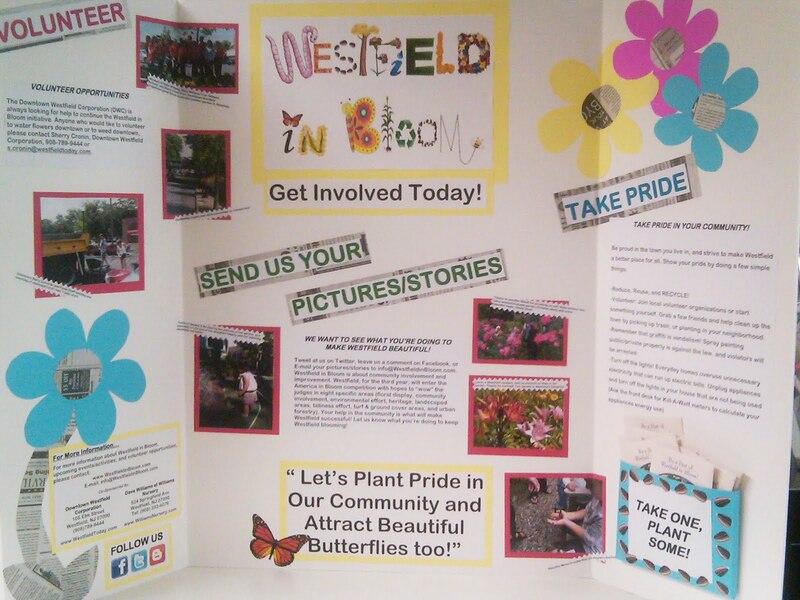 We are asking for volunteers, and for people to send in pictures of their gardens and what they are doing to make Westfield a better place. This helps document all initiatives taken to help the Town. The poster also provides a few simple steps to becoming more environmentally friendly. Free seed packets are also available for anyone to take and plant. The special mix attracts monarch butterflies. Still confused about what ‘Westfield in Bloom’ actually is? For the past two years, Westfield has entered the America in Bloom competition (locally known as Westfield in Bloom). America in Bloom (AIB) is an independent, non-profit organization dedicated to promoting nationwide beautification programs and personal and community involvement through the use of flowers, plants, trees, and other environmental and lifestyle enhancements. The nation-wide grassroots program believes that connecting people and plants is important to everyone’s quality of life. While providing a framework for continuous improvements in communities, America in Bloom’s competition judges cities and towns on eight criteria: Tidiness Effort, Community Involvement, Environmental Effort, Landscaped Areas, Turf & Ground Cover Areas, Heritage Preservation, Floral Display, and Urban Forestry. Westfield was honored to receive the top prize for towns their size in the 2010 America in Bloom competition and won the Landscaped Areas Award for all entrants across the country.